I’ve spoke of the benefits of house plants before, that is reducing indoor air pollution among other things. During the winter you pretty much are restricted to indoor plants. All too often we end up thinking of houseplants are a decorator item and not the true living items they are. Plants can be a substitute for art or furniture used often for design reasons. The problem is when used this way they usually do not do as well. They are much like all the political candidates. They look and sound good but something is missing from the overall package. With politicians they talk a good game full of grand plans but don’t give much in HOW they can deliver. With indoor house plants it usually comes down to light as the short coming. 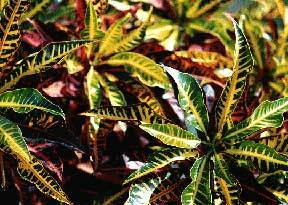 You may flip on some lights and point some florescent bulbs at your plants and in general think the room has good lighting, but to a Croton calling that dark corner home – it is another matter. Light is almost always the the factor that limits success with indoor plants. Overhangs, trees and window treatments can cut the available light dramatically. For example a Croton until good bright light will produce colorful of gold, yellow, red and orange foliage that is a show stopper. Move the plant 2 – 3 feet away from the light source and the colors fade away. All is not lost! Bright indirect light are conditions that colorful African violets enjoy. All it takes is matching up lighting conditions with the right plants.